Brigid is torn. If she stays in her beloved Ireland, she is another mouth to feed in a land plagued by starvation and poverty. If she leaves, she will never see her family again. But leave she must. There is not enough food. Heartbroken, she boards the ship that will take her to a new life in Australia, comforted only by the knowledge that her cousin Jamie will make the journey with her. Her skill as a lacemaker soon draws attention, but life doesn’t always run smoothly in the harsh new landscape. 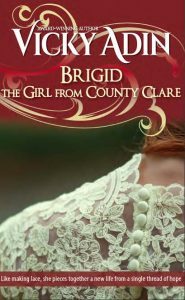 Brigid must learn to conquer her fears and overcome the stigma of being a servant, a female and Irish if she is to fulfil her dream. A new start in New Zealand offers hope – until the day encounters the man who seeks her downfall. This was a delightful book and reminded me of an author that got me hooked on great stories about everyday people and their struggles to make a better life for themselves. It is not often that I put a book in the same sentence as Catherine Cookson, but this book fits. I know very little about the struggles in Ireland but I feel that this book could be the story of a real young girl, who leaves a struggling family in Ireland…to make a new life for herself. Brigid is a strong character, showing the struggles she has mostly alone in a country she is not familiar with. The book flows very well…keeping you ever wondering what is going to happen to Brigid next. (will she succeed in making a successful life?) There was never a slow part of the book…keeping you quickly turning the pages for more. Highly recommended and look forward to more books by this author – IndieBRAG reader. The historical aspects of the story are so accurate and described so perfectly that the reader will frequently need to remind herself/himself that the story is fiction….This is a thoroughly satisfying read. It is the kind of story thatpasses the test as a work of history and is equally satisfying as a novel that will have your attention from first to last. 4 stars – Frank O’Shea, The Irish Echo, Sydney. An extremely well-researched historical novel. The author’s accuracy and attention to detail was evident throughout the novel. …an entertaining and enjoyable historical novel – IndieBRAG reader. With an incisive eye for historical detail and bridging fact with fiction, Vicky Adin brings strong characters and plot to her Pastfinders books. Brigid is a real page turner – Jenny Harrison, author of The Lives of Alice Pothron.